The Petal Cap puts a unique twist on a bottle cap that gives it a flower-like appearance. The Petal Cap is designed to work with our existing Bottle Cap Co Accessories. The inside and top of the cap are 1" and 2 3/4" as with our standard, vintage, and jumbo bottle cap collections. 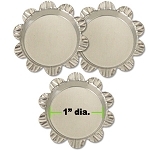 The Petal Cap is a great way to expand your existing line of jewelry and craft projects. *Manufactured exclusively for Bottle Cap Co.
Petal Cap Pendants are also available!